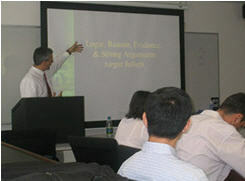 Kelton Rhoads, Ph.D., studied and practiced persuasion as an art for years – as a grantwriter, a public relations officer, and a director of marketing and communications – but became increasingly dissatisfied with intuitive approaches to persuasion, and the guesswork utilized by most persuasive “experts.” Seeking a verifiable source of evidence and fact regarding what causes people to change their behaviors, he pursued a doctorate in Social Psychology, specializing in persuasion and compliance. He is now an influence consultant based in Los Angeles, California. He has provided training, consulting, and presentations for industry, government and defense agencies, political candidates, credit and banking firms, non-profit philanthropic organizations, educational agencies, public relations firms, and a number of medical entities, helping people apply the principles of influence to real-world situations. His work has been published in a variety of scholarly and popular journals on topics relating to persuasion. He has given radio interviews on the subject, and has received print and TV advertising awards. Kelton partners with Amy to provide influence training workshops, and message testing through our Crossfire Research methodology. He has also partnered with Amy on proprietary TSG research projects on what causes legislators to change their minds, and upcoming research on who legislative trust factors. Using the latest peer-reviewed research on the science of human behavior, Amy and Kelton also audit written and electronic advocacy materials (Influence Quotient) to make your advocates more likely to respond to your requests for action. Rhoads has taught communications, statistics, psychology, and English at the university level, and currently serves as an adjunct professor at U.S.C.’s Psychology Department and The Annenberg School for Communication. Rhoads completed his doctorate in Social Psychology at Arizona State University in 1998. Previously, he received a master’s degree in English from Loma Linda University, and obtained a baccalaureate degree in History from Pacific Union College. Francine has been with TSG in several roles since 2002, and specializes in maintaining TSG’s databases and client administrative duties. Francine has 25 years of experience in administrative and technical support in industries such as banking, construction and executive suites. Francine attended the University of Cincinnati and Cincinnati State Community and Technical College majoring in computer repair/networking. She has also received certificates from Great Oaks Institute of Technology in Microsoft Office products and in medical terminology. She resides in Cincinnati, Ohio with her husband and three children. Fran enjoys spending her free time with her two grandkids. Jackie coordinates special TSG outreach projects as well as projects for the Innovate to Motivate conference. She has over 25 years of experience in administrative support roles in a variety of business settings. She received a certificate in Microsoft Office products from Great Oaks Institute College. Jackie has also received numerous certificates pertaining to office etiquette procedures. Jackie was an Air Force brat, spending most of her life moving from country to country and city to city. She resides in Cincinnati with her husband. They have three grown daughters and three grandchildren. She enjoys traveling and spending time with her grandchildren.